From NPR comes a very interesting graph and hypothesis. 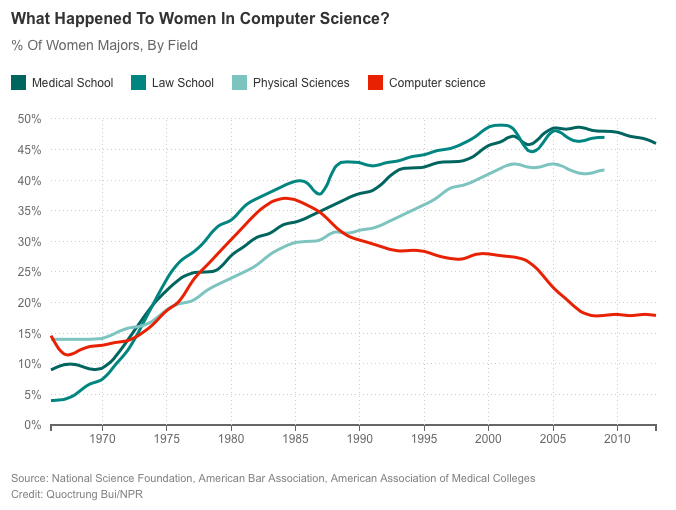 The graph shows that the percentage of women who received degrees in computer science was actually rising until the 1980s and then started dropping. The highly intriguing hypothesis is that the personal computer revolution during the 1980s mainly featured very simple applications like games that were primarily aimed at men. In fact it was this revolution that gave rise to the stereotype of the geek, tech-savvy, socially awkward male, a stereotype that is now nauseatingly on display in the nooks and crannies of Silicon Valley. This trend would be consistent with some of the other things we know about the field: We know that the tech industry is male dominated, we know that women who try to get into computer science face all kinds of social and cultural barriers, and as demonstrated recently by the fiasco of 'Gamergate' we know how appallingly unfriendly certain extensions of computer technology can be to women. Interestingly the previous healthy presence of women in the field reminds me of something that I have been reading in Walter Isaacson's engaging new book "The Innovators". Isaacson documents that the percentage of women with degrees in math was actually higher in the 1930s than in the 1950s. I wonder if similar factors - perhaps the extensive application of math and physics to war-related problems, an activity that might have been viewed as predominantly "male" - were responsible for women dropping out of the mathematical professions then. In any case, while correlation is not causation, these findings would certainly be consistent with the cultural factors that make it harder for women to enter the field. Which is something that we can always ponder and remedy.